Denies his side a goal in comical fashion. 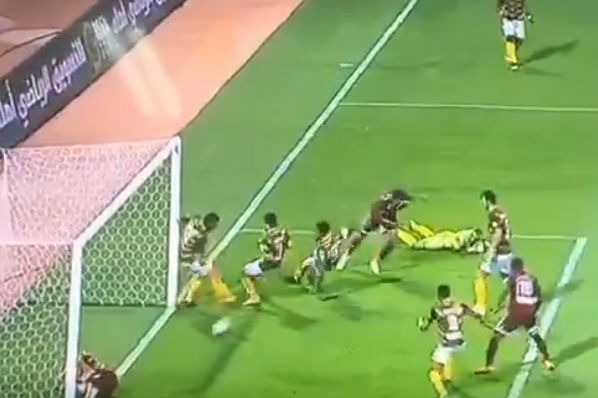 A bizarre scramble in a Saudi Arabian match ended with an Al-Faisaly player denying his team a goal with his backside while lying injured on the goal line. In a sequence already remarkable for the inept attempts of the Ohod goalkeeper to claim the ball, an injured player unwittingly prevents a goal in comic fashion. The commentator sounds suitably amused as the on-pitch farce unfolds during Al-Faisaly’s 2-0 win over Ohod at the King Salman Sport City Stadium.